Las mareas oceánicas afectan profundamente las operaciones marítimas costeras. Este módulo presenta el origen, las características y la predicción de las mareas. Después de presentar la terminología común, el módulo examina los mecanismos que causan y modifican las mareas, incluidos los efectos astronómicos y meteorológicos. El módulo concluye con una discusión de las técnicas y los productos de predicción de mareas. Este módulo incluye una atractiva presentación gráfica, narración e interacciones. very good lesson is complicated learn all the adverities that affect the waves, but this lesson makes it easier. Good lesson for beginners, although the physical explanation of why astronomical tides take place is a bit unaccurate, in my opinion. The last question of the quiz I can't find anywhere mentioned in the lesson. Overall great lessons. Just wish there was a better overall section to give us an outline that we could fill in with information/notes that we received from the lesson. Taken this course has been an assset to my General Knowledge. I hadn't had a previous course related to such an important facts. I know I have to review more and more, but it is an excellent resource!!! Interesting to get a little more familiar with the field. 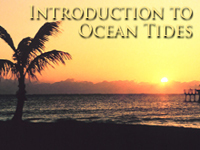 A good basic intro to tides. its really good and useful very clear and understanding information. I have just finished the module. It gives simple and clear picture of physics of tide appearance. I think even non specialist can easily understand the information. And illustrations are good. Just completed the module and am quite impressed with its content and approach. Highly recommended for anyone that must deal with tides. It is really very good and useful publication. Perfectly explains the causes of the phenomenon, showing modern methods of research and analysis. I recommend this work to all my students. Julio de 2014: El material conceptual de esta lección sigue siendo sólido. Sabemos que los productos presentados en la sección final son anticuados, los modelos predicen las mareas en muchos más lugares que en el pasado, y los sitios web que se mencionan han evolucionado considerablemente desde 2006.